In this lesson, we will walk you through a team registration for the YMCA Competitive Registration Portal. If you have bookmarked your YMCA portal or your home webpage address for your TeamUnify site please login to the system. If not, you can search for your team’s portal from the National YMCA Swimming and Diving Website. When you have found your address please click Sign In and login using your login email address and the password you created for your account in the previous lesson. 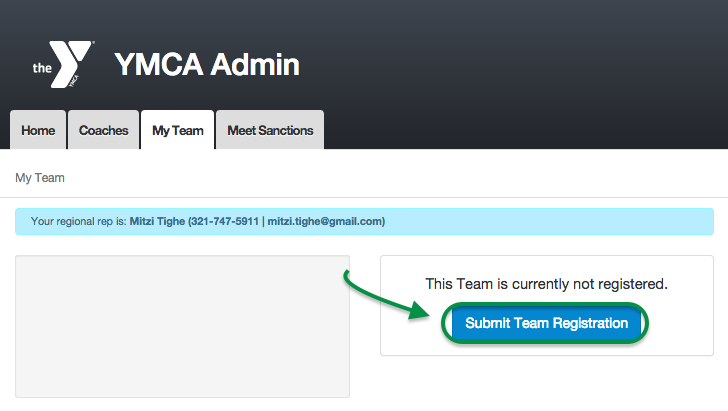 In the side menu click YMCA Admin > My Team. Your team details will now load into view on the My Team tab. Note your Regional Rep’s name and number in blue at the top in case you have any questions. As a requirement for YMCA Team Registration, you will need to ensure that the information for your team is as complete and accurate as possible prior to submitting your team registration. This includes Team Profile, General Info and Staffing, Program Info, and Facility Info. Once you have updated your team information click Save. Your information will then be uploaded to the YMCA Database. To submit your Team registration, scroll back to the top of the page and click the Submit Team Registration button. This will open a form to pay for your team registration via credit card. If you do not have a CC on file, simply fill in credit card and billing details (click Copy From Account Info to save time), then click Next. If you already have a CC on file, simply fill in the CVV of the card. If you want to use a different CC than the one you have on file, click Add/Select Card, then click Add New Card, fill in credit card and billing details (click Copy From Account Info to save time), and click Next. Click Submit & Pay, then OK to confirm. That is it. You will now receive additional details via email, and you will see the status of your registration on this page. You can return to this page at any time in the future to review the status of your submission. You are now done with the team registration submission process. It is now time to submit coach registrations or meet sanctions.